Badedas Original Bath Gelee is the world-famous thick, dark green bath gel with the strong and refreshing fragrance of a lush forest. Made in the UK. 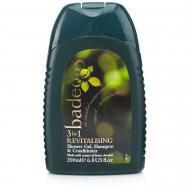 Badedas Revitalizing Shower Gel, Shampoo and Conditioner combines the luxury of the Badedas range with the convenience of a 3 in 1...shower gel, shampoo and conditioner. German Badedas "Vital" Original is made in Germany with the fragrance of horse chestnut essence known for its healthful properties, particularly beneficial with circulation. It has a strong, fresh pine-like fragrance, suitable for the whole family.